Bus Shelter Ads using Feonic Surface Speakers create attention grabbing promotions. No visible loudspeaker boxes, wires or grilles. Our technology is hidden behind the bus shelter surface – safely inside the structure. Free from the attention of thieves or vandals. No TOO LOUD Hotspots. Just the right volume to attract, engage and entertain. Consider this case study, installed by Primesight – http://www.primesight.co.uk/. Hear a Cough : Catch Attention. People waiting at the bus stop hear the sound of a man coughing before a voice urges people to visit their GP if they, or someone they know, has had a cough for three weeks or more. The shelter has been placed in Sandgate, in Ayr’s town centre. Run by the Scottish government’s Detect Cancer Early campaign, the project aims to raise awareness of a cough as a key sign of lung cancer. The bus shelter also bears the image of a man coughing, alongside the campaign’s strapline – “Don’t get scared, get checked”. Glass, Wood, Metal, Plastics etc can all be Surface Speakers. For ads or real time information. Feonic Surface Speakers are ideal for both transport information and digital out of home advertising (DOOH). Turn a simple advertising display into an attention grabbing device. Add spoken voice or music effects. The audio needn’t be loud and only plays when people are detected nearby. Unique diffuse sound ensures sound pollution is minimised. Our drives are small, lightweight and are easy to install and remove. Move them to a new location to attract the attention of a new audience. Lightweight amplifiers are available, with audio input from sources such as mp3 players. 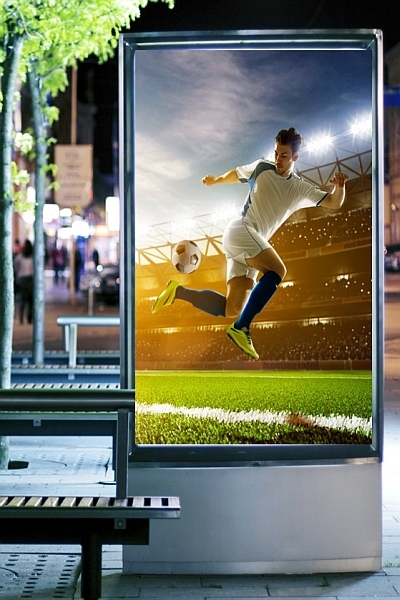 Boost bus stop ads and promotional effectiveness using audio visual techniques. The materials used in bus shelter construction are perfectly suited to being driven by Feonic Surface Speakers. And being hidden behind surfaces, the drives have no obvious physical location. No untidy, dirty grilles nor obvious opportunities for vandalism. Sound envelops the nearby location in an immersive manner without being loud or aggressive. Install in a panel in the roof providing sound evenly to all those in the shelter. Opportunities for improved accessibility for the blind by providing audio messages on the bus currently arriving. Bus Stop Digital Signage – Transit Shelter Advertising – Accessibility Improvements for visually and hearing impaired. Help your advertisers get their message across. Improve your communication to passengers. Get in touch to see how Feonic can help you. Need a few more ideas? Visit our main website page on creative use of our invisible speaker technology.